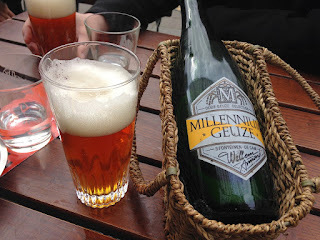 Okay so not really talking about a new beer today- just getting totally excited because Mr. T and I are off to Europe tomorrow and heading back to my very favorite geuzestekerij/brewery Drie Fonteinen. Last time in Brussels we got a chance to check out Drie Fonteinen during their very limited open days event and even meet the man himself Armand. I absolutely cannot wait to check out the brand new space lambik-O-droom and drink that fantastic golden gueuze on site. The trip kicks off in London, then it's onto Paris, Brussels, Brugges then back to London before our final stop in Reykjavik. It's our six year wedding anniversary celebration of sorts. Last year we spent number five at Hillstone and BYOBed our wine in. Obviously we needed to kick this year up a notch. I'll be posting throughout the week on things I've just been really behind on but if you want to see our trip just follow me on Instagram at NYCTastes. See Ya!